John Arnone has leased his land for gas drilling. His neighbor Denise Dennis has not. 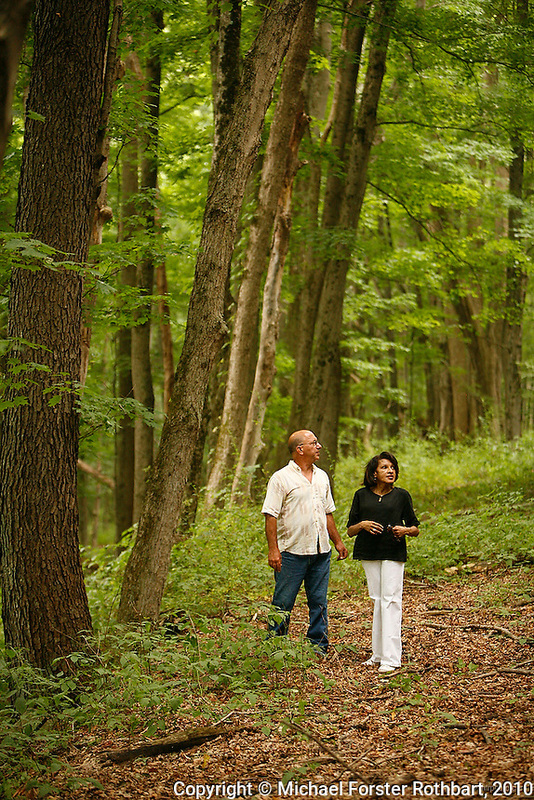 Here, they visit Dennis' 153-acre family homestead in Hop Bottom, PA. The Dennis Farm has been in the family for seven generations, since her ancestor Prince Perkins became one of the first free blacks to settle in Susquehanna County in 1793. Dennis hopes to restore the farm, which includes a family graveyard, original foundations and spring, and an 1859 farmhouse on Martin's Creek. However, uncertainty about natural gas drilling on adjacent properties has made finding funding impossible. Dennis herself sometimes swears she will not lease her land for drilling, but at other times wonders if revenue from gas wells could fund restoration of the property. The 2005 Energy Policy Act exempted natural gas drilling from the Safe Drinking Water Act. Scientists have identified volatile organic compounds (VOCs) such as benzene, ethylbenzene, toluene, methane and xylene that have been found in contaminated drinking water near drilling sites. Other environmental concerns include surface water contamination, air pollution and health problems. On the other hand, gas companies and property owners may earn up to one trillion dollars in profits from drilling in the Marcellus Shale.